BAND OF BROTHERS: GHOST PANZER is the second in a series of fast playing games of squad level combat in WWII. It is a STAND ALONE GAME that follows the critical success of BAND OF BROTHERS: SCREAMING EAGLES. 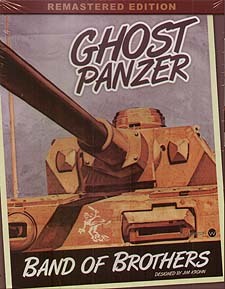 Ghost Panzer, named for the symbol used by the German 11th Panzer, follows the division from their invasion of Russia in 1941 up until their withdrawal to the Western Front in 1944. All of their major battles are represented including The Bloody Triangle (the largest tank battle until Kursk), Operation Typhoon and the drive on Moscow, (they came within 12 miles of the capital), Case Blue, the relief attempt of Stalingrad, the Backhand Blow, the southern pincer at Kursk, and the Korsun Pocket. The system includes Suppression, Proficiency, Casualty Ratings, and not knowing how your units will respond until they are needed - based on years of research, this game is COMPLETELY DIFFERENT from any other squad level game. It is VERY REALISTIC, but the realism is baked into the system. Players will spread their troops out, fire, and manoeuvre in a realistic fashion, not because a rule forces them to, but because the system rewards this realistic play. This allows the game to be INCREDIBLY SIMPLE. There are no combat charts and very few exceptions to remember even though the game includes infantry, tanks, and artillery. For those who have Screaming Eagles, this game introduces early and mid-war German tanks, Panzer Grenadiers, halftracks, flamethrower tanks, Stukas, hills, trenches, and a large array of Russian squad types and tanks. The game also includes a couple of OPTIONAL RULES including unconfirmed kills, infantry flanks, and combat events. There is also a simplification of the infantry proficiency system. The game includes 16 scenarios. Two of them require ownership of Band of Brothers: Screaming Eagles to play. The Remastered Edition includes updated art on all the hardmounted boards.